In January, we began to impatiently stalk an intriguing new escape game as it staked its claim on some prime I-Drive real estate. The Escape Game Orlando officially opened its doors last month at the growing I-Shops complex on the corner of Sand Lake Road and International Drive, and it truly is a whole new escape room experience. The company's first foray into escapism launched to much fanfare in Nashville, Tennessee. While some of their most popular Nashville room themes have made their way to Orlando, more rooms with completely unique themes are in the works. Currently, potential players can choose between Classified! and The Heist. Preview details for the next room - Prison Break - can be found on the Escape Game Orlando website. 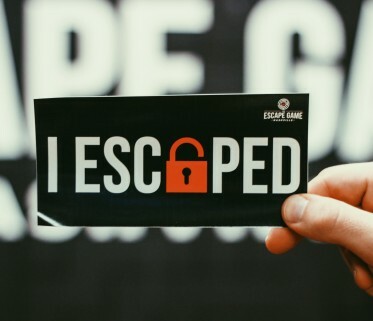 If you're still new to the escape game... it's a craze that is quickly making its way to the United States, and winning over thrill seekers, geeks, competitive types, and families, friends, and co-workers seeking a unique bonding experience. In other words - this is something everyone can enjoy. Escape rooms provide a series of challenges - both mental and physical - that combine to solve the ultimate puzzle that will result in your release from a locked room where the pressure is most definitely ON. You see, you have only one hour to figure out all of the pieces that pave the way to your escape! Orlando has (to date) six very different escape rooms, with three being on the coveted I-Drive strip. Each escape room location... as well as each individual room within... is very different. The themes vary greatly, the challenges are all diverse, and the level of difficulty ranges. At Escape Game Orlando, The Heist is known to be the true stumper. I'm no fool (and I didn't want to look like one), so I opted to tackle Classified! on my recent visit. I recently gathered up my usual escape team of four (two male, two female... ages 15, 18, and 30-something), and we made sure to have well-rested brains before taking on our mission to save the nation from a terrorist threat. 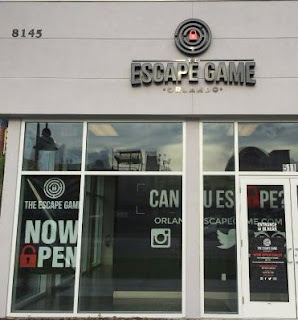 You register for your Escape Game Orlando experience right from their website. Select the number of players that you are booking for, the room you prefer (or "any" if you want to keep your options open), and the time and date you wish to book the room. Simple as that... you're set for your adventure. The minimum number of players for any game is two; the maximum number varies, but is usually seven or eight. If you do not book a room to capacity, other players/ teams may book the available slots. When you arrive, you'll be asked to confirm your registration and sign waivers at a registration desk. The waiting area at Escape Game Orlando feels professional and serious. It helps to set the stage for the important missions that await. Your Game Guide will lead you to your room at game start time. Here, you'll view a briefing video that covers the rules of the game, and outlines the premise of your mission. In Classified!, we had one hour to determine the time, date, and location of a terrorist attack in an effort to thwart their mission. You have three free clues to use if you get stuck along the way. Use them wisely!! After those three, any requested clues will result in time loss! At Escape Game Orlando, you are provided with a walkie-talkie to call for help at any time. A countdown clock screen doubles as a communication tool when your guide needs to send you a message or visual clue. The hardest part about reviewing the escape rooms is the inability to provide extensive details! After all, I encourage everyone I meet to go to the escape rooms - and why would they go if I went on a spoiler spree? I can, however, provide a few opinions and very unspecific elements. Always remember... there is more to your room than first meets the eye. Escape rooms start small, but there's always more to explore than what you initially see before you. Classified! had a very unique, amusing room-to-room transition with a nice twist. The challenges and puzzles were very diversified. Some where simply amusing. We found ourselves chuckling here and there, and scrambling around nervously mere minutes later. Certainly, everyone in your party can find a niche that is perfectly suited to their skill-set. This is where the teamwork is a vital component. Remember, your goal in this room is not simply to escape, but to prevent the impending terrorist strike by uncovering attack details. This adds a second layer of pressure and demand to your experience! We escaped from Classified with little more than a minute left to spare... but we escaped! When you escape, you're rewarded with the appropriate sticker - praising your victory, or... your "almost" victory. You're also given the option to purchase brag swag to proudly display your success. Escape Game Orlando is surprising. The relatively small space it occupies feels like a big new world once the door locks behind you. When the clock starts ticking, an instant adrenaline rush takes over as you have no choice but to take your mission seriously. The atmosphere is one that truly transforms you to new surroundings. Everything around you holds the potential to propel you forward in your efforts, or steal precious moments on a bad hunch - but you'll have fun figuring out which items hold promise, and which are little more than a snazzy distraction. There's something invigorating and empowering about a successful solution to each individual challenge you conquer along the way. Even if you fail to escape in time, you'll be proud of the situations you tackled and toppled as you progressed. Escape Game Orlando is $28 per person. For more information, follow them on Twitter or Facebook.